The Halloween parties this weekend are over, but that doesn’t mean there’s not time for a few more to finish a build before children start knocking on doors tonight. 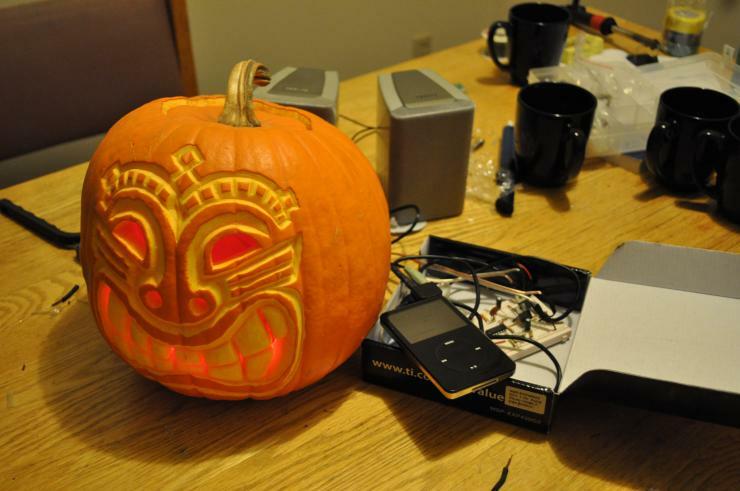 [formori] at Lakehead University wanted to do something spectacular for a pumpkin carving contest, so he and a few other EE students came up with a tiki-o’-lantern with music. The guys at Lakehead figured a color organ flashing LEDs in the eyes and mouth of the tiki would be a very good and easy project. The circuit they used is a simple Op-amp setup like one we’ve seen earlier. The entire pumpkin is powered by a 9 V battery and the music is played with an iPod. There are two colors of LEDs – high frequencies flash a blue LED in the eyes and low frequencies flash a red LED in the mouth. Aside from the added A/V stuff, [formori]’s pumpkin is one of the best we’ve seen on Hack a Day this year. Check out the Youtube of 1st place winner of the Lakehead pumpkin carving contest after the break. [Kyle] was looking for a way to spice up his boring brick-wall dorm room. The Christmasqualizer he came up with brightens up his room and would make an awesome place for a rave. The strings of lights in [Kyle]’s Christmasqualizer are off-the-shelf Christmas lights. A simple circuit for the 7-band equalizer was built following this article. The build uses an MSGEQ7 equalizer chip takes audio from any source. The volume level of the seven EQ bands are output to an Arduino over a serial connection. After the EQ chip was connected to the Arduino, [Kyle] needed a way to switch the strings of Christmas lights on and off. A few solid state relays later, and he was in business. All the code for the Christmasqualizer is up on github. The sketch is pretty simple – connect the EQ chip as per the article, then connect the relays to the output pins on the Arduino. It’s a fun and easy project that really livens up a dorm room. [Charles] wanted to put some LEDs in his guitar. He also wanted individual notes to output certain colors, but he couldn’t find any projects with tone-based algorithms to convert sound into colors. After about a year of work, his ColorChord guitar was born. Unlike every other color organ build we’ve seen, the color of a note does not relate to the absolute pitch of the note. Instead, the colors are mapped within a musical key. A I chord will always be Yellow, a IV chord will always be purple, and a V chord will always be blue. 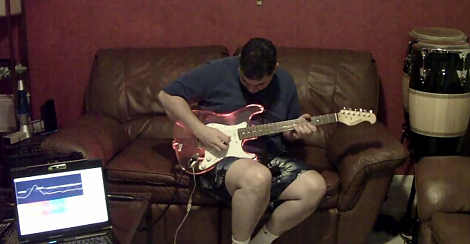 Playing in the key of C will have the LEDs output yellow, purple, and blue for a C, F and G chord, respectively. Halloween may have come and gone but thats no reason not to take a look at this neat little special effects setup. Basically it uses an analogue circuit to monitor an audio signal and triggers some camera flashes using 5V relays. The idea is that you can play lightning strikes and other spooky sounds, and the system will trigger camera flashes to coincide with the lightning strikes. Adding in some color organs in addition to the camera flashes will dim your lights to help achieve a thunder like effect. Unfortunately there aren’t any schematics for the color organs (which technically might be just light organs) but that doesn’t detract from the seemingly well designed analogue signal processing. Check it out in action after the break.